Protesters gathered outside China’s embassies and consulates as well as the Hong Kong government’s Economic and Trade Offices in 22 cities across 20 countries on Thursday and Friday 12-13 October. 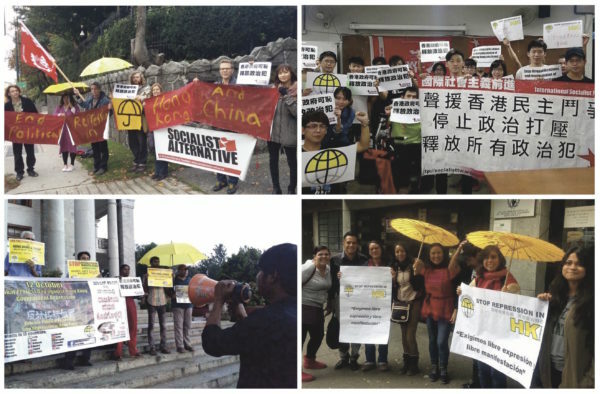 The protests were part of a newly launched international campaign, Global Solidarity – Stop Repression in Hong Kong. 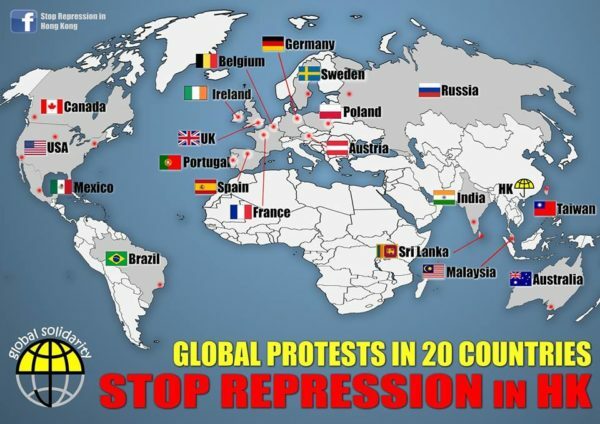 The long list of protest locations included Taipei, Colombo, London, Berlin, Vienna, Brussels, Mexico City, Lisbon, Stockholm, Paris, New York, San Francisco, Chicago, Kuala Lumpur, Melbourne and Vancouver. This was the most widespread international solidarity action ever organised in support of democratic rights in Hong Kong. Protesters in Bangalore, India, defied a police ban in order to go ahead with their demonstration, while in the Russian capital Moscow anti-democratic laws that severely limit freedom of expression meant that only one brave young woman was permitted to take part in the protest outside the Chinese embassy. 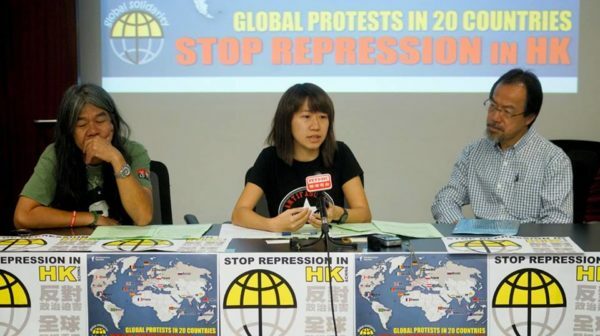 The protests and the campaign statement from Stop Repression in Hong Kong were presented to Hong Kong journalists at a press conference in the Legislative Council on Friday. Speeches by three members of the Irish parliament – Paul Murphy TD, Ruth Coppinger TD and Mick Barry TD – were shown on video, underlining that this was not a one-off protest but the start of a campaign to increase international pressure on the unelected Hong Kong government over its recent attacks on democratic rights. Another video published on Facebook by the campaign’s supporters in Hong Kong has been viewed over 20,000 times during its first three days. “We see a clear and very disturbing trend emerging in Hong Kong of authoritarian politics,” said Paul Murphy in the press conference video. “This is shown by the removal of six legislators, including the removal of long-standing democracy campaigners like ‘Long Hair’ (Leung Kwok-hung) even after they won their seats in the 2016 elections. This is nothing other than election fraud, when governments ‘abolish’ election results that go against them,” he said. Hong Kong press conference for Stop Repression in Hong Kong campaign (from left: Leung Kwok-hung, Sally Tang Mei-ching, Dr Fernando Cheung. Sally Tang Mei-ching of Socialist Action (CWI in Hong Kong), who is a coordinator of the campaign, described the recent repression in Hong Kong as unprecedented. 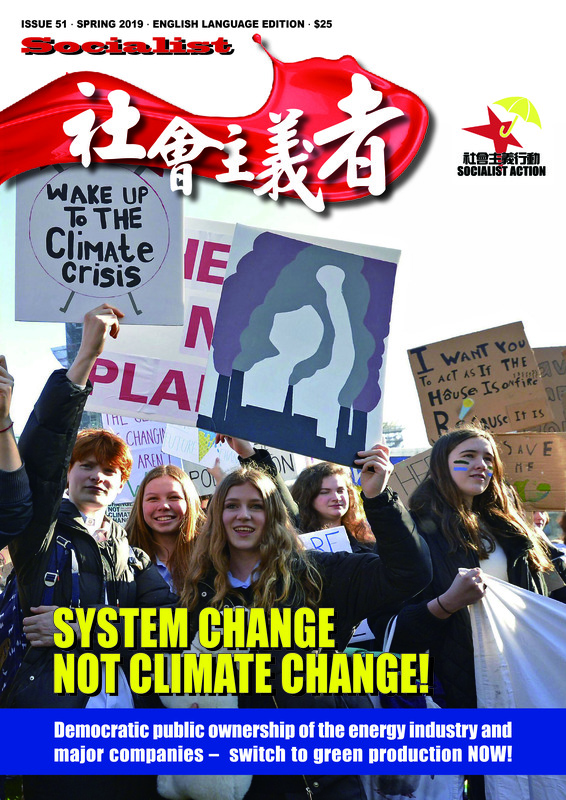 “Left-wing councillors, labour activists and union representatives of different countries have recently helped to launch this campaign, organising through it a series of international solidarity actions,” she explained. When asked by the media if the international protests would achieve anything, she stressed that it was only the beginning of the campaign and the government should have every reason to be worried that their policies were arousing concern and criticism around the world. The international solidarity from grassroots organisations and ordinary people can encourage further mass resistance against the repression inside Hong Kong and also in China against the CCP (so-called ‘Communist’) dictatorship, she said. Also in attendance at the Hong Kong press conference were ousted legislator ‘Long Hair’ of the League of Social Democrats (LSD), who is a prime victim of the government’s undemocratic purge, and four legislators including Fernando Cheung Chiu-hung of the Labour Party and Shui Ka Chung, an independent pan-democrat. The campaign is demanding the release of political prisoners in Hong Kong. This is a term the CCP-controlled Hong Kong government hotly rejects. However, the use of the courts to impose harsh jail sentences on democracy activists, including many youngsters and prominent representatives of the 2014 ‘Umbrella Revolution’, is widely seen as a politically motivated attack on the democracy movement and an attempt to criminalise mass protests. A new trial of 20 activists was held on Friday 13 October. They are accused of defying a court order to clear the Mongkok occupation site during the Umbrella protests, and all 20 were found guilty. This outcome was expected given the current repressive climate in Hong Kong. The sentences will be handed down next week and it is feared many if not all the 20 will also go to jail, where 16 young activists are already serving sentences for their role in political protests calling for democracy. 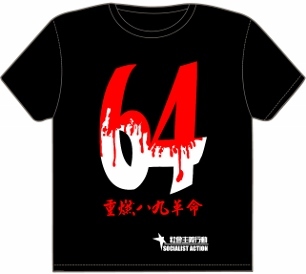 The government’s political purge is particularly targeting the more radical and struggle-orientated sections of the democracy movement such as the LSD and student-led party Demosisto. International protests 12 October against repression in Hong Kong (clockwise, from top left): Vancouver Canada, Taipei Taiwan, Mexico City, Bangalore India. The press conference and the international protests were reported in Apple Daily, Oriental Daily, South China Morning Post and also US-mouthpiece Voice of America. Links to these media reports follow at the end of this article. The Stop Repression in Hong Kong campaign has also started a petition signed by members of parliament, left political parties, and union activists in more than 15 countries. It has been signed by leaders of national student organisations in two countries – Spain and Malaysia. The campaign is appealing for more signatures especially from individuals and organisations active in mass struggles. Looking for support from workers’ organisations and the Left internationally is quite natural, said Sally Tang Mei-ching, because the establishment parties and pro-capitalist governments are supporting and working with the Chinese regime. 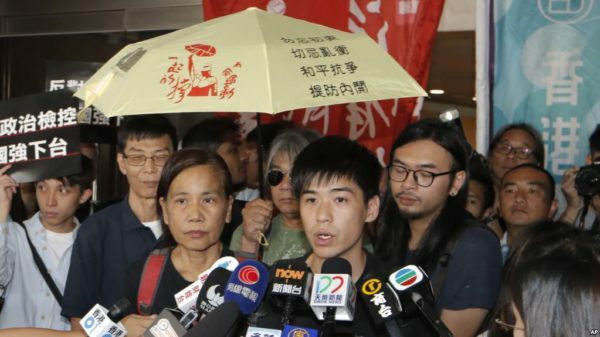 20 Umbrella activists found “guilty” at 13 October trial including Chan Po-ying of LSD and former student leader Lester Shum.